Spoiler Pirate says "Yarrr! There be spoilers ahead! Published by Konami and developed by Climax Studios, Silent Hill: Shattered Memories is a marked departure from the franchise built on fear. Although Shattered Memories has its fair share of jump cuts and sudden shrieks, its purpose is slightly more benign. While the elements that do seek to terrify are every bit as interesting as the complete package, the sensation I am most interested in is worry. The driving force, the root of the game's tension, and the feeling most necessary to evoke, is concern. Few games so explicitly attempt to instill anxiety within its players. The primary method for fomenting worry in players is to attach a certain level of doubt to in-game elements. Nothing builds tension quite like in-game uncertainty. Resident Evil 5 is one of many titles that distress players by limiting ammunition. A lack of bullets during a battle is frustrating, but a shorter supply of bullets after said battle is even more disconcerting. Making players feel weak, incapable, and unsure of themselves builds tension and makes them worry about the next inevitable confrontation. Konami ran with this idea and made a bold decision to remove combat from Shattered Memories entirely. 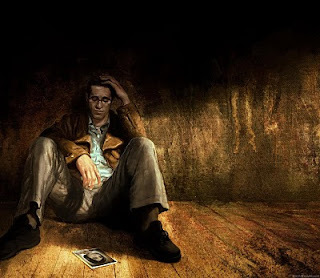 The protagonist Harry Mason, controlled in a pseudo-third-person manner, searches for the whereabouts of his daughter Cheryl by poking around the town of Silent Hill. 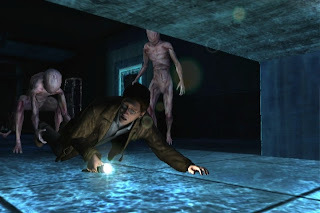 The game consists of exploration and very basic puzzle solving, interspersed with "nightmare" scenarios in which Harry flees a cadre of faceless and ever-persistent monsters eager to tackle Harry into oblivion. Without means to combat these flayed creatures, the moments preceding a nightmare evoke strong sensations of uneasiness. Nightmares often accompany narrative twists and are introduced by the world, and its occupants, turning into ice. The environment becomes a dark and confusing maze. Paths are marked in bright blue, but can easily lead the player in circles. The controller emits static notifying the player of nearby monsters and potentially providing a way to orient one's self. This is only occasionally helpful however, merely postponing the inevitable. Harry can only hide from the hideous creatures for so long. Eventually, he must pass by them and find safety. While these segments can grow tedious, they do successfully evoke worry and distress by exploiting weakness and uncertainty. The game hinges on a different focus of concern entirely. Harry's distress over his missing daughter should be our distress. In order to buy Harry's pursuit of his daughter despite insane circumstances, we must believe his worry is genuine. The game seeks to evoke worry and convey Harry's convictions primarily through repetition. The psychiatric profiling that takes place during Shattered Memories alters the story slightly, potentially changing Harry's behavior and attitude. His concern for Cheryl, however, is unerring. Harry tells every character about his daughter without hesitation. Of the people he can call on the phone, several of them are told about his plight whether or not they can be of any help. Harry is ever only slightly distracted. Despite his bizarre circumstances and the pleas of others, he always continues on, often irrationally. There are also reminders of Cheryl's presence. The shadowy specter of a young girl, presumably Cheryl, is spotted on several occasions. Mementos and phone messages with a child's voice remind Mason, and the player, of Cheryl's predicament. On a few occasions, Harry talks to Cheryl on the phone. These moments are accompanied by static, a voice laden with panic or sadness, and serve only to drive Harry and the player forward. Bolstered by decent voice work, and cryptic and unsettling allusions to Cheryl scattered throughout Silent Hill, Harry Mason's concern for his daughter becomes our own. There are several moments during Shattered Memories that took my by surprise and made me reassess my interpretation of the game. In one of these scenes, Harry calls his daughter only to have a grown woman answer the phone. Openly hostile towards him, she tells Harry that Cheryl does not want to speak to him. As the game progresses, these bizarre moments become more frequent. With expert fluidity, the focus of concern shifts from Cheryl to Harry Mason himself. What if the psychiatrist is treating Harry for schizophrenia? What if Harry actually killed his daughter? What if she does not exist at all? Clearly the world is not right. What if, in his heroic pursuit, Harry hurts himself or succumbs to madness completely? There is something to say for good characterization. While Shattered Memories is far from perfect, the characters feel genuine and so do their concerns. Despite Cheryl's absence, she feels ever present and that much more realistic. While I will not reveal the climactic narrative twist, the focus of concern moving from Cheryl to Harry is repeated and the conclusion is rewarding. Shattered Memories builds tension by asking the player to worry about nightmarish creatures and missing family members. Despite its unique take on the franchise, Shattered Memories is just as emotionally evocative as its predecessors. I'm glad you've helped draw attention to this critically overlooked game. I've taken issue with its superfluous puzzle elements, which needlessly cling to genre formula, in my view; but I feel guilty about not properly praising the game for the many things it does right. It's a shame so many of the puzzles were ridiculously easy and the nightmare scenarios, which make narrative sense, are just painfully obnoxious. That being said, I hope people give it a try also. I'm shocked it turned out as well as it did.